We love supporting USA made products, more than that, we love supporting Minnesota businesses! So please welcome back to our shop, Softbums. Now that Softbums has snap closures available in both their diaper covers, plus a better design and quality, I am happy to have their brand back on my shelves! We will stock the Softbums covers with snap closures only as the veclro is less than reliable. Now let’s chat about what makes the Softbums different from other diapers. Softbums has inserts that snap in by the back of the diaper. This secures the insert while baby maybe wiggling and squirming on the changing table making for a quicker diaper change. Softbums are also a one-size diaper. They can be sized by adjusting 2 toggles located in an opening in the front of the diaper. Using the toggles to adjust the leg elastic size can be a little tricky at first, but once you figure that out, you can easily get a custom fit for any baby body size. Two cover options are available, the Echo and the Omni. The Echo cover is a cover that can be reused. Inside the cover it is lined with fleece so it is not wipe-able, but the fleece does make for a comfortable fit on babies. The Omni is a little larger than the Echo and is open in the back so you can choose from snapping in an insert to use it as a cover or putting the insert in the pocket to use as a pocket diaper. Both the Omni and the Echo are very soft and comfortable for baby to wear. 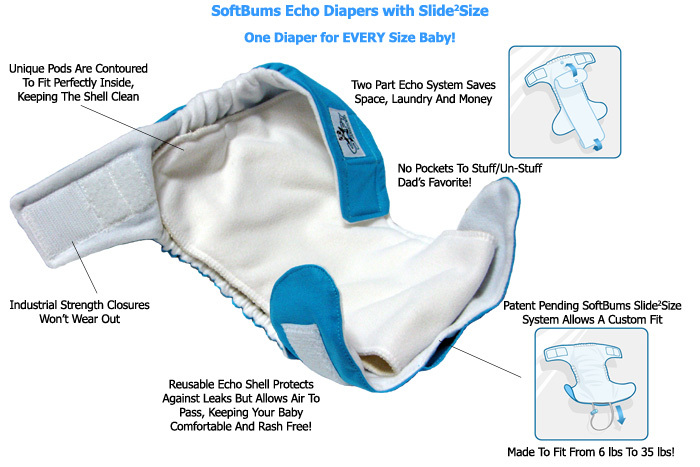 If you want a cover to fit your baby right after birth, the Echo is for you. It is smaller so it will fit earlier that most one-size covers, but that does mean it will be a little smaller after 25+lbs. The Echo fits smaller inserts inside better, since it is so trim. For a bigger fit, try the Omni. The Omni can fit over most any insert or prefold. It will be bigger on newborns, but it will fit till potty training. Remember, with both covers you can get the Softbums inserts that snap in or use whatever you prefer inside. Have you tried Softbums yet? Let us know if you have any questions about the Softbums diapers. We have used these diapers with our kids so can answer any questions you may have about them. Give these a try, especially if you love supporting Minnesota businesses! You can check these diapers out here. This may or may not come as a surprise to you, but I love cloth diapers. I don’t just own a business that sells them to make money. I own the business I do, because I really do love cloth diapers. To me, cloth diapering is one of the best kept secrets. Of course, not all people, yes even my friends and family members, do not share my enthusiasm for cloth diapers. Some are even completely turned off by them thinking they are gross, hard to use and very time consuming. Not only that, but it’s something that tree huggers and flower people do. Well, let’s talk about the non-tree hugging stuff for a moment. First, I want to talk about why I love cloth diapers. Besides the fact that they are super cute, they are actually really easy to use. I only wash our diapers every 4-5 days. This really hasn’t added any noticeable work to all the laundry I feel like we as a family are doing already. So that’s easy. What about poop you say? Many people picture cloth diaper using parents as hanging over a toilet dunking poopy diapers in it and swishing them around. Geez, really?! I have never done this. This sounds horrible to me! For the first 6 months (before baby starts eating solids), you only need to change the diaper and store it in a dry, yes even cute, wet bag. No swishing and absolutely no buckets of soaking poopy diapers either! After the baby starts solids, they make these awesome toilet paper thin liners that you can put on top of your diapers, then when the baby poops, you just remove the liner and flush it and the poop down the toilet. EASY! The last part I love about cloth diapers…fewer leaks than disposables! There’s a myth going around that cloth diapers leak all the time and that you need to use disposables when you go out of the house. The truth is that when you are using great cloth diapers, that fit well on your baby, and are washed correctly, they do leak less than disposables. The main reason why they leak less is because you can get a much better fit with cloth diapers. They have nice fitting elastic around the legs and back to help prevent blow outs and the cloth absorbs faster than the chemical absorption used in disposables. Awesome right?! The #1 reason most people start using cloth, MONEY! That tug at my pocket book is what motivated this frugal mama to cloth diaper. Using cloth has been a huge money saver for us. Over the last 5 1/2 years (2 kids fully diapered and 1 5 month old still in diapers) we have spent only about $600 for cloth diapers. WOW! On average disposable diapers cost about $70 a month, which means I have saved $4,550. Every time I add this up I am shocked that the diapers I love have saved me this much money, because really, now I would do it even if they were just as expensive as disposables. Now, as far as trees go, what’s so bad about hugging them? I mean they are wonderful and we need them. I’m not even sure when the concept of choosing to do what’s best for the planet became a negative. After all, that’s where we live! I personally feel like, even with recycling and composting, I throw away too much. That stuff has to go somewhere. At least with using cloth diapers, I can keep at least one full bag of poopy diapers out of the landfill each week. After two and a half years of using disposable diapers, that adds up to about 120 BAGS! Then, times that by 3 kids, that’s a whopping 360 bags that take 200-500 years to decompose. Can you imagine your great great great grand kids being able to see the poopy diapers you wore as a baby? Eew. I could go on with more environmental benefits and health benefits, but my point is not to bore you nor to make anyone feel guilty. My point is to share my love of cloth diapers with you, to give you just a snap shot of the benefits and how easy it can be, in hopes that more people will give it a try. It is defiantly worth a try! Need a little more incentive to take the leap? We are running a campaign for cloth over the next several weeks where anyone who joins the campaign can win some free diapers. Check out our campaign details HERE! Anyone can join the campaign, even if you don’t use cloth, but if you do use cloth and you blog about it and share the campaign, you can also be entered to win a $50 Gift Certificate to Little Neetchers! Join the campaign and help other fall in love with Cloth diapers!